The Problem of the Color Line - who is nicka smith? Genealogy has a dirty secret and hardly anybody is talking about it. Genealogy is lily white. As in Eurocentric. As in lacking melanin. As in focused almost entirely on the population of people who identify with ancestry existing solely in Europe. Genealogy is so white that despite demographic data from the U.S. Census Bureau, it’s establishment still hasn’t come to the realization that it must diversify on all levels in order to stay relevant and profitable. “Even more diverse than millennials are the youngest Americans: those younger than 5 years old. In 2014, this group became majority-minority for the first time, with 50.2 percent being part of a minority race or ethnic group. Family history researchers trust data from the U.S. Census Bureau more than oral history from their own families. One would imagine that release of the information I just shared would have shifted the genealogy world because of the pre-existing trust in the organization providing the data, right? More inclusion. More diversity. More options. I wish I could say that I was wrong. But as a messenger among many here in these genealogy streets I must tell you that statement is wrong. Very, horribly, terribly wrong. People of color have spent decades seeking recognition in the mainstream, initially starting with pushing for laws to protect our very right to exist. We’ve called for inclusion of our voices in the American story because we are as American as anyone who had immigrant ancestors that traveled through Ellis Island. Our story is so important to the very fabric of the United States that there are museums for Native Americans and African Americans that operate and educate millions on our national mall. But, why is it the the genealogy world is slow to come to the light on the issue of diversity? Let’s take a trip back, since that’s what we do in this family history world. 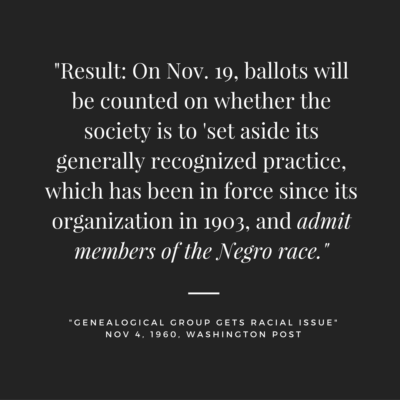 While the article doesn’t name who the man of color is, many believe he was James “Jimmy” Dent Walker, founder of the Afro American Historical and Genealogical Society (AAHGS). Word on the street is that he was lead to form AAHGS because of his repeated rejection from organizations like NGS. It seemed like NGS had finally gotten itself together by 1999 when Walker was elected to their hall of fame six years after his death. He is the only person of color to hold that designation to this day. The Federation of Genealogical Societies (FGS) “put a little yeast on it” (in the words of my father) and has a memorial lecture at it’s conference in his honor. But one can’t help but wonder if these honors were bestowed with good intentions or just to save face because of the transgressions of the past? Fast forward to today. 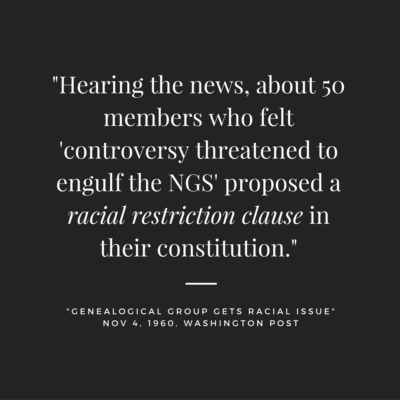 People of color are able to apply for membership in organizations like NGS without issue. But if you take a stroll through the speakers list or topics at most national conferences, which gather thousands of people on a yearly basis, they don’t reflect the statistics I quoted earlier from the Census Bureau. In fact, it’s like people of color don’t even exist on the planet let alone in the world of genealogy; sort of like American television and film. You’re probably thinking “Well, no one of color probably submitted a proposal to speak at these conferences or registered to attend these events.” Bless your heart, unfortunately you’re wrong. Me and others have kept data on this for the past four years. Hardly any of people of color are selected to speak at the most attended conferences. Some have experienced as many as SEVEN presentations being rejected despite being the most notable African American speakers and educators in the industry. Then, likely as a reaction to seeing no one who looks like them marketed as a presenter, people of color aren’t coming out in droves as attendees either. These folks aren’t just submitting proposals for topics aimed at African American genealogy research either, they’re covering the full gamut of what is needed in the research toolbox, but they are getting rejected left and right by the big named conferences. But enough from me. I’ll let you hear directly from the mouths of people of color who are speakers and attendees. Clearly genealogy, as a whole, is not holding hands, singing campfire songs. Let’s get to some solutions. Advertising – If your website and conference materials reflect that your entity is inclusive or diverse based upon the images being used, you must truly be diverse. You don’t have to lie to kick it. We will come to your event and see that no one else like us is there and then tell everyone else that lies were detected in your representation. Topics and Speaker Representation – If you lack diversity, what organizations have you reached out to in your area to ensure that people of color attend and present? “If we build it, they will come” is outdated. Michael Jordan never sold a shoe that was kept locked away in a closet at the Nike headquarters. It was marketed to death hence people to this day have an insatiable need to have his shoes and he’s hasn’t played a game of professional basketball in 13 years. In that same vein, conference planners should make it their business to fill their programming with diverse topics and presenters. Take a cue from the Southern California Genealogical Society or Texas State Genealogical Society. They get it and continually have speakers and topics that are inclusive. Also, don’t think filing the schedule with one minority group is enough. People of color are diverse and your offerings should be as well. True Calls for Proposals – In light of recent discussions on this topic, a comment was made that people of color “should submit their potential topics to conference planners before the call for papers goes out.” This took many of us aback. Why on earth would someone go outside the guidelines set forth and circumvent the process unless there was a culture already established that allowed for this behavior? I truly want to believe that the calls for proposals/presentations are indeed authentic, but I now question if it’s just a smokescreen to C.Y.A. in the case that someone calls an organization out on their approval process. Be An Ally – A couple years back, me, Angela Walton-Raji, and Bernice Bennett held a panel at a conference that discussed ways that the genealogy community could be more inclusive. One of the things we discussed was the need for allies within the community who were not people of color. There are some, but not nearly enough. Why haven’t more people felt empowered to speak up for us when we’ve identified the issue of diversity year after year? If you sit on a board or conference committee and you know that your group or event is not diverse enough, use the power of your position and call practice out. 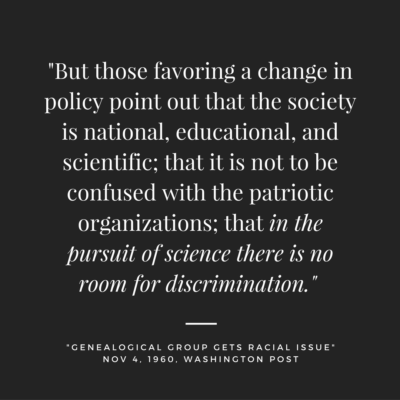 On the other hand, if you are a person of color, it is our duty to call attention to the lack of diversity – bring it to the attention of leadership, ask for inclusion and if the request falls on deaf ears, walk away with your dignity and/or membership dollars and invest them in ground that is fertile for your growth as a genealogist and family history researcher. There is no sense in applying over and over again when an organization has made it clear that our ilk is not what they seek. Allies should stand in solidarity with people of color if they encounter resistance as well. Otherwise, it’s business as usual for those who don’t want change. Earlier this year, Thomas MacEntee noted he wouldn’t be submitting to speak at NGS’ conference in North Carolina because of legislation enacted that discriminates against the LGBTQ community. The genealogy community came out in droves to show their support of his decision. But where are the same people when it comes to representation of people of color? Is it cognitive dissonance or fear? A choice not to do anything is still an action. The silence is deafening. We hear it all loud and clear. What has been your experience? What ways do you feel genealogy can be more inclusive? Sound off below. 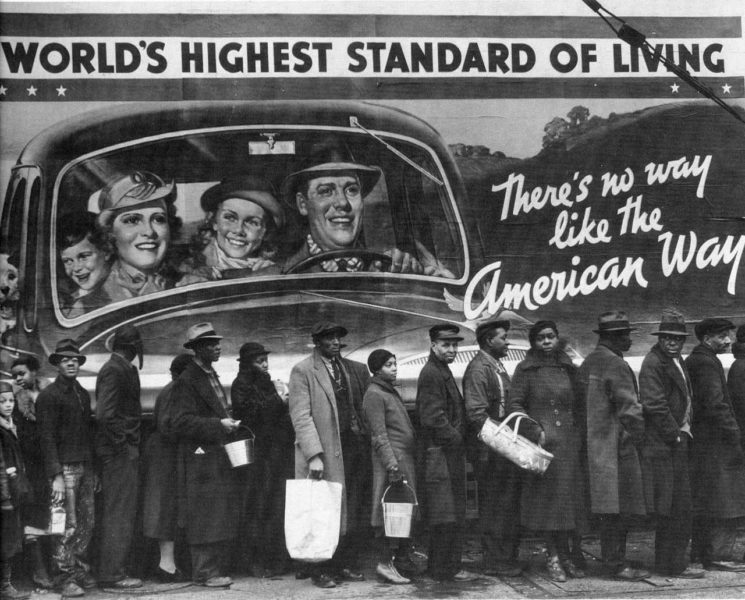 (1) US Census Bureau. “Millennials Outnumber Baby Boomers and Are Far More Diverse.” The United States Census Bureau. N.p., 25 June 2015. Web. 04 Oct. 2016. <http://www.census.gov/newsroom/press-releases/2015/cb15-113.html>. (2) “About NGS.” National Genealogical Society. N.p., n.d. Web. 05 Oct. 2016. <http://www.ngsgenealogy.org/cs/ngs_bylaws>. (3) Rasa Rustatis. 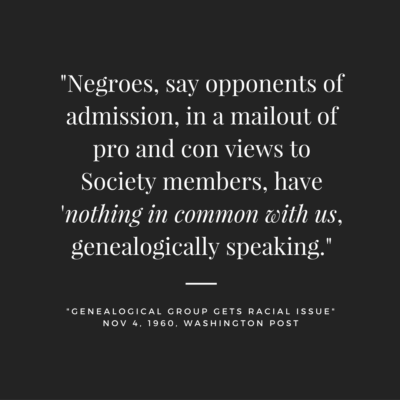 “Genealogical Group Gets Racial Issue.” The Washington Post, Times Herald (1959-1973). ProQuest Historical Newspapers, 4 Nov. 1960. Web. 5 Mar. 2012. African Americans specifically embody the very antithesis of the “lily white” image many have of their own family trees. Genealogy is the field where this is proven more than any other. Need we not remind the genealogy world that it was the story of one African American man named Alex Haley that propelled genealogy to new heights? Our voices should be heard in as many forums as possible, but I also don’t believe in going where we are not wanted. Everyone’s ancestors are important and we should be hearing from presenters in all ethnic groups. For people to think that POC “have nothing to do with us” as we travel our genealogy journey is absurd. We need to hear from all who research family trees. Each experience has valuable information for all of us. I have recently discovered a small percentage of AA and NA in my DNA. Several of my ancestors were slave holders. I want to hear and learn how to research these groups in order to find my ancestral POC and to get the names of those enslaved out and help their families find them. What better way than to attend conference sessions speaking directly to that from those who are experts in the area. Thank you for getting the message out. You have support from many in the community. We are willing to support and help make a change.